OTOVEL® (ciprofloxacin and fluocinolone acetonide) was designed to help make dosing as simple as possible for you and your child. Gently clean any fluid (discharge) from the outer ear using a clean cloth or tissue. Do not put a cotton swab or any other object in the ear canal. Remove OTOVEL from the protective foil pouch. Pull apart 1 single-dose vial of OTOVEL by tearing along the dotted lines until it is fully separated. Warm the dose of OTOVEL by holding the vial in your hand for 1 to 2 minutes. 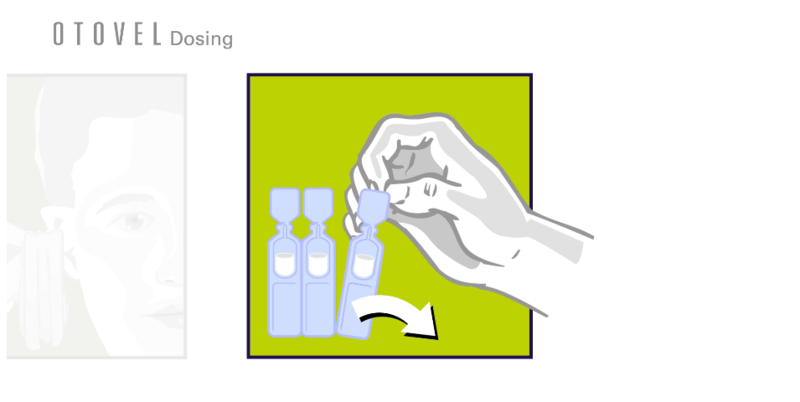 Twist off the vial cap in the direction of the arrow as shown below (figure 1). Have your child lie on his/her side with the infected ear up as shown below (figure 2). 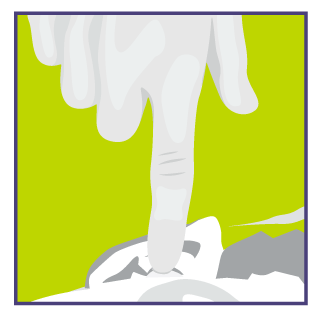 Hold the vial of OTOVEL in your hand and place the vial close to your child’s ear. Let the entire dose of OTOVEL fall into the affected ear. Gently press the tragus (the small outer portion of the ear that partially covers the ear canal) 4 times, using a pumping motion as shown below (figure 3). This will allow the drops of OTOVEL to enter the middle ear. Have your child remain on his/her side with the affected ear facing upward for 1 minute. If your healthcare provider has told you to use OTOVEL in both ears, repeat Steps 2-9 for the other ear. Safely throw away OTOVEL vials after use. You can access printable Instructions for Use, which have been approved by the Food and Drug Administration. Have you heard about Otovel? It's a combination antibiotic—ciprofloxacin—and corticosteroid—fluocinolone acetonide. 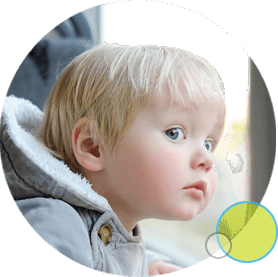 Otovel is a prescription ear drop for the treatment of acute otitis media in children with ear tubes caused by certain bacteria. The antibiotic part of Otovel treats the infection inside the ear while the corticosteroid works to reduce inflammation, which includes pain and swelling. Otovel is designed for accurate dosing, as you'll soon see. It comes in 14 single-use vials containing 1 premeasured dose each. Otovel is dosed twice a day for 7 days. Every single-use Otovel vial contains 1 premeasured dose that is sterile, precise, and preservative free. Because each vial contains 1 premeasured dose, there is no drop counting needed. There is also no mixing or shaking required and giving Otovel to your child is as simple as following these steps. The first step in dosing Otovel is to make sure you wash your hands with soap and water. Then, clean your child's ear with a clean cloth or tissue. Be sure not to stick a cotton swab or other object into the ear canal. Once you've removed Otovel from its foil pouch, pull 1 single-use vial away by tearing along the dotted lines. Next, warm the vial by holding it in your hands for 1 to 2 minutes. Putting cold liquid into your child's ear may cause dizziness, so it's important to make sure you warm the vial in your hands first. While you're warming the vial, have your child lie on their side with the infected ear facing up toward you. 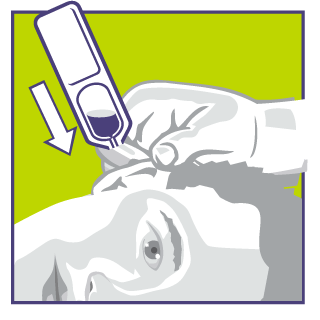 Open the vial by twisting off the vial cap then hold the vial close to the ear and squeeze the contents into the ear. Once the entire dose is in the ear, use your finger to gently press the part of the ear called the tragus 4 times. Use a pumping motion. This will help Otovel drops get into the infected part of your child's ear. Keep your child on their side for 1 minute to make sure the medicine flows into the infected part of the ear. If your child's other ear is infected, repeat the process for that ear. Once the time is up, your child can go back to normal activities. 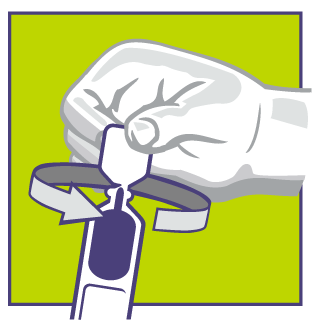 All you need to do next is to safely dispose of the empty vial. To find out more about Otovel, explore Otovel.com. Indications: Otovel is used in children 6 months of age and older who have a tiny, cylinder tube in their eardrum known as a tympanostomy tube to prevent excess fluid in the middle ear. Otovel is used to treat a type of middle ear infection called acute otitis media with tympanostomy tubes, AOMT, caused by certain bacteria. Important safety information: Do not use Otovel if your child is allergic to quinolones including ciprofloxacin, corticosteroids including fluocinolone acetonide, or any of the ingredients in Otovel; has an outer ear canal infection caused by certain viruses including chicken pox (varicella) and the herpes simplex virus; or has a fungal ear infection. Before using Otovel, tell your healthcare provider about all of your child's medical conditions, including if they are pregnant or plan to become pregnant, although Otovel is not expected to harm the baby, are breastfeeding or plan to breastfeed, although Otovel is not expected to pass into the breast milk to harm the baby. Tell your healthcare provider about all the medicines your child takes, including prescription and over-the-counter medicines, vitamins, and herbal supplements. Call your healthcare provider right away if fluid continues to drain from the ear after finishing treatment with Otovel, fluid drains from the ear 2 or more times within 6 months after treatment has stopped. Otovel may cause serious side effects including allergic reactions. Stop using Otovel and contact your healthcare provider if any of the following signs or symptoms of an allergic reaction occur: hives, swelling of your face, lips, mouth, or tongue, rash, itching, trouble breathing, dizziness, fast heartbeat, or pounding in your chest. The most common side effects of Otovel include fluid draining from the ear, ear infection, ear itching, extra tissue that grows on a part of your body that has been injured, swelling of the outer part of the ear, ear pain or balance problems. Tell your healthcare provider of any side effects that are bothersome or that do not go away. These are not all the possible side effects of Otovel. Call your doctor for medical advice about side effects. You may report side effects to FDA at 1-800-FDA-1088. For more information, ask your healthcare provider or pharmacist, or consult the full Prescribing Information at www.otovel.com. Reference: 1. OTOVEL [package insert]. Atlanta, GA: Arbor Pharmaceuticals, LLC.